You will learn how to write a simple gene quantification tool based on RNA-Seq data. RNA-Seq refers to high-throughput sequencing of cDNA in order to get information about the RNA molecules available in a sample. Knowing the sequence and abundance of mRNA allows to determine the (differential) expression of genes, to detect alternative splicing variants, or to annotate yet unknown genes. In the following tutorial you will develop a simple gene quantification tool. It will load a file containing gene annotations and a file with RNA-Seq read alignments, compute abundances, and output RPKM values for each expressed gene. Albeit its simplicity, this example can be seen as a starting point for more complex applications, e.g. to extend the tool from quantification of genes to the quantification of (alternatively spliced) isoforms, or to de-novo detect yet unannotated isoforms/genes. You will learn how to use the FragmentStore to access gene annotations and alignments and how to use the IntervalTree to efficiently determine which genes overlap a read alignment. This section introduces the FragmentStore and the IntervalTree, which are the fundamental data structures used in this tutorial to represent annotations and read alignments and to efficiently find overlaps between them. You may skip one or both subsections if you are already familiar with one or both data structures. The Fragment Store subsumes all these data structures in an easy to use interface. It represents a multiple alignment of millions of reads or mate-pairs against a reference genome consisting of multiple contigs. Additionally, regions of the reference genome can be annotated with features like ‘gene’, ‘mRNA’, ‘exon’, ‘intron’ (see PredefinedAnnotationTypes) or custom features. The Fragment Store supports I/O functionality to read/write a read alignment in SAM or AMOS format and to read/write annotations in GFF or GTF format. The Fragment Store can be compared with a database where each table (called “store”) is implemented as a String member of the FragmentStore class. The rows of each table (implemented as structs) are referred by their ids which are their positions in the string and not stored explicitly. The only exception is the alignedReadStore whose elements of type AlignedReadStoreElement contain an id-member as they may be rearranged in arbitrary order, e.g. by increasing genomic positions or by readId. Many stores have an associated name store to store element names. Each name store is a StringSet that stores the element name at the position of its id. All stores are present in the Fragment Store and empty if unused. The concrete types, e.g. the position types or read/contig alphabet, can be easily changed by defining a custom config struct which is a template parameter of the Fragment Store class. In the Fragment Store the tree is represented by annotationStore, annotationTypeStore, annotationKeyStore, and others. Instead of accessing these tables directly, the AnnotationTree Iterator provides a high-level interface to traverse and access the annotation tree. The IntervalTree is a data structure that stores one-dimensional intervals in a balanced tree and efficiently answers range queries. A range query is an operation that returns all tree intervals that overlap a given query point or interval. The interval tree implementation provided in SeqAn is based on a Tree which is balanced if all intervals are given at construction time. Interval tree nodes are objects of the IntervalAndCargo class and consist of 2 interval boundaries and additional user-defined information, called cargo. To construct the tree on a set of given interval nodes use the function createIntervalTree. The functions addInterval and removeInterval should only be used if the interval tree needs to be changed dynamically (as they not yet balance the tree). Files can be read from disk with the function read that expects an open stream (e.g. a STL ifstream), a FragmentStore object, and a File Format tag. The contents of different files can be loaded with subsequent calls of read. As we want the user to specify the files via command line, our application will parse them using the ArgumentParser and store them in an option object. In your first assignment you need to complete a given code template and implement a function that loads a SAM file and a GTF file into the FragmentStore. Use the code template below (click more…) and implement the function loadFiles to load the annotation and alignment files. Use the file paths given in the options object and report an error if the files could not be opened. Open STL std::fstream objects and use the function read with a SAM or GTF tag. ifstream::open requires the file path to be given as a C-style string (const char *). Use string::c_str to convert the option strings into C-style strings. The function read expects a stream, a FragmentStore and a tag, i.e. Sam() or Gtf(). Now that the Fragment Store contains the whole annotation tree, we want to traverse the genes and extract the genomic ranges they span. In the annotation tree, genes are (the only) children of the root node. To efficiently retrieve the genes that overlap read alignments later, we want to use interval trees, one for each contig. To construct an interval tree, we first need to collect IntervalAndCargo objects in a string and pass them to createIntervalTree. See the interval tree demo in demos/interval_tree.cpp for more details. As cargo we use the gene’s annotation id to later retrieve all gene specific information. The strings of IntervalAndCargo objects should be grouped by contigId and stored in an (outer) string of strings. For the sake of simplicity we don’t differ between genes on the forward or reverse strand and instead always consider the corresponding intervals on the forward strand. In your second assignment you should use an AnnotationTree Iterator to traverse all genes in the annotation tree. For each gene, determine its genomic range (projected to the forward strand) and add a new TInterval object to the intervals[contigId] string, where contigId is the id of the contig containing that gene. Use the code template below (click more..). Implement the function extractGeneIntervals that should extract genes from the annotation tree (see AnnotationTree Iterator) and create strings of IntervalAndCargo objects - one for each config - that contains the interval on the forward contig strand and the gene’s annotation id. You can assume that all genes are children of the root node, i.e. create an AnnotationTree Iterator, go down to the first gene and go right to visit all other genes. Use getAnnotation to access the gene annotation and value to get the annotation id. Use appendValue to add a new TInverval object to the inner string, see IntervalAndCargo constructor for the constructor. Your third assignment is to implement a function that constructs the interval trees for all contigs given the string of interval strings. Use the code template below (click more…). Implement the function constructIntervalTrees that uses the interval strings to construct for each contig an interval tree. Optional: Use OpenMP to parallelize the construction over the contigs, see SEQAN_OMP_PRAGMA. Optional: Construct the trees in parallel over all contigs with an OpenMP parallel for-loop, see here for more information about OpenMP. To determine gene expression levels, we first need to compute the read coverage, i.e. the total number of reads overlapping a gene. Therefore we use a string of counters addressed by the annotation id. For each read alignment we want to determine the overlapping genes by conducting a range query via findIntervals and then increment their counters by 1. To address the counter of a gene, we use its annotation id stored as cargo in the interval tree. Given the contigId, beginPos, and endPos we will retrieve the annotation ids of overlapping genes from the corresponding interval tree. Your fourth assignment is to implement the count function that performs all the above described steps. Optionally, use OpenMP to parallelize the counting. Use the code template below (click more…). Implement the function countReadsPerGene that counts for each gene the number of overlapping reads. Therefore determine for each AlignedReadStoreElement begin and end positions (on forward strand) of the alignment and increment the readsPerGene counter for each overlapping gene. Optional: Use OpenMP to parallelize the function, see SEQAN_OMP_PRAGMA. Make sure that you search with findIntervals where query_begin < query_end holds, as opposed to read alignments where beginPos > endPos is possible. Reuse the result string for multiple queries (of the same thread, use private(result) for OpenMP). In the final step, we want to output the gene expression levels in a normalized measure. We therefore use RPKM values, i.e. the number of reads per kilobase of exon model per million mapped reads (1). One advantage of RPKM values is their independence of the sequencing throughput (normalized by total mapped reads), and that they allow to compare the expression of short with long transcripts (normalized by exon length). 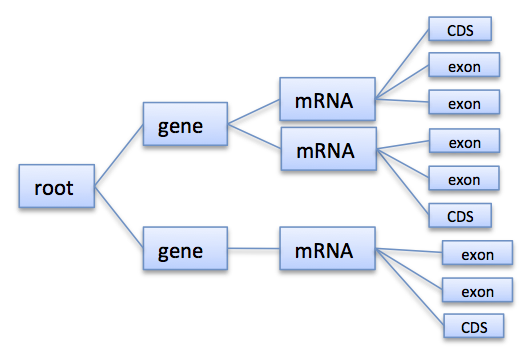 The exon length of an mRNA is the sum of lengths of all its exons. As a gene may have multiple mRNA, we will simply use the maximum of all their exon lengths. Download and decompress the attached mouse annotation (Mus_musculus.NCBIM37.61.gtf.zip and the alignment file of RNA-Seq reads aligned to chromosome Y (sim40mio_onlyY.sam.zip). Test your program and compare your output with the output above. Use the code template below (click more…). Implement the function outputGeneCoverage that outputs for each expressed gene the gene name and the expression level as RPKM as tab-separated values. To compute the maximal exon length use three nested loops: (1) enumerate all genes, (2) enumerate all mRNA of the gene, and (3) enumerate all exons of the mRNA and sum up their lengths. Remember that exons are not the only children of mRNA. See [MWM+08] for further reading. Read the SAM and BAM I/O Tutorial and change your program to stream a SAM file instead of loading it as a whole. Change the program such that it attaches the RPKM value as a key-value pair (see assignValueByKey) to the annotation of each gene and output a GFF file. Continue with the Tutorials rest of the tutorials]].